Heating and air conditioning companies in DFW are swamped with the recent temperature drop. “We can run up to 40-50 calls a day,” said Troy Berry with B&B Heat & Air in Dallas. One of Berry’s calls on Thursday was to a woman in Ferris, whose heater had stopped working overnight. When she woke up, the temperature in her house nearly matched that of outside. “So, it was 17 degrees here this morning, so you can imagine how cold it was. It was probably 27, 26, 28 degrees inside the home,” said Berry. Berry said even with the increase in calls, he’s working to provide same-day service to customers because of the extreme weather. Berry said many times heater problems can be prevented if people take the right steps. “The first thing is cleanness. Makes sure you have a good clean filter. The other thing is when it gets this cold, [your heater] is only going to reach a certain degree. Don’t over work it. Set your temperature down a few degrees to make sure it keeps working,” said Berry. Out on the roads, the Texas Department of Transportation is working to keep roads clear if snow or ice were to fall across North Texas. Crews have been pre-treating roads with brine, instead of the usual salt-sand mixture. 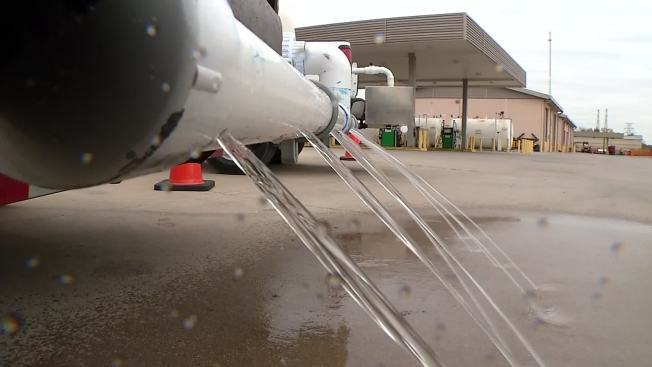 “In the past, we were using the liquid salt-based anti-icer and we would have to time it correctly,” said TxDOT spokesman Ryan LaFontaine. “We couldn’t do it too soon and we couldn’t do it too late. If you put it down too soon the cars would blow it off the road. What brine does, it forms a residue on the road and it can stay for a week to a week and a half,” he said. LaFontaine said TxDOT implemented its Emergency Operations Center on Thursday. He said employees will be at the center 24-7 to monitor the weather and road conditions. If a wintry mix were to begin to fall, crews could jump into action immediately.